Months ago I signed up for the Star Wars Dark Side Challenge. 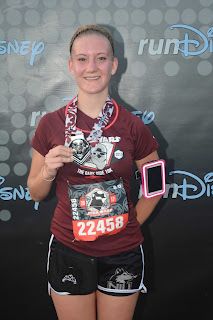 The race weekend is finally here and I've already completed the 10k! 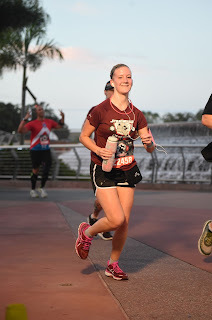 I'll be honest that I didn't expect to be happy with my results this weekend due to a foot injury, but I am thoroughly impressed by myself with my 10k time. I attended the expo on Thursday, April 20th, and had planned to make it a quick trip. Picking up my bib took about 5 minutes. I had printed my race waiver the night before and was easily able to locate the tables for the Dark Side Challenge bibs. Like what typically happens I had to be reminded to produce my ID. For some reason I always forget to pull it out of my wallet before I reach the table. From the bib table I went over to the tshirt pickup. Because I was participating in the Challenge my shirt pickup was in the same building as bib pickup. For those of you who haven't attended a race at Walt Disney World there are two different buildings of ESPN Wide World of Sports utilized for the expo. One building hosts the bib pickup, preordered merchandise pickup, and shirt pickup, the other buildings hosts the vendors, shirt exchange, and the big Disney merchandise booth. From the bib pickup I went over to the expo building. My plan for this was to see what the race specific merchandise was for this event, and to see the Sparkly Soul booth. I'll be honest, I was not impressed with the Disney merchandise. The magnet for the challenge is an "I did it!" magnet, which I find stupid. Obviously, if I'm displaying the magnet I have completed the race. I would have preferred to have a themed magnet that matches the other challenge items. The beer glass (or water glass if you follow Disney names), is just to add to my collection. Somehow I've fallen into collecting glasses relating to the races I have run. As for the headband, I have no excuse other than I'm slightly addicted to wearing and collecting headbands. I know in past years there have been issues with Disney having enough items for those who arrive later in the day. I arrived about 5:30-6:00 pm and was able to find everything I wanted. It seems that Disney either has figured out their problems with stocking or these items were not in high demand. My stop after the Disney was the Sparkly Soul booth. I stumbled upon these headbands at the Hot Chocolate 15k Expo in Chicago and only bought my first one because it said "Run Chicago" and I wanted a bit of my hometown with me when I moved. Ever since then I've been in love with these headbands, I'm working on building a collection with every color because I wear them constantly. These can be found under my helmet when I ride, or holding back my bangs when I'm hanging out at home or running. They stay where I put them even during a hard run or a day working at the barn. My only issue is that with my longer bangs I do look a bit like a mad scientist with the bangs flopping behind the headband, so I was excited to see that Sparkly Soul had come out with a wider headband. I haven't worn it yet so I can't vouch for the quality but hopefully it matches with the rest of the Sparkly Soul line. Now for the race. As I had said above I recently injured my foot during a training run so for the past two weeks I've been taking it easy. I started the 10K this morning expecting to go slow, enjoy the sights, and try not to stress my foot. For the first 3 miles I kept a pretty consistent pace and didn't feel too stressed. But I was super warm and actually found myself drinking more of my Powerade than normal. It was cool, and dark during this first 5k, and the course wasn't too crowded. I felt comfortable doing a walk/run at a slow pace and didn't feel like I was going to get run over or end up in someones way. The second half of the race went a bit slower for me. Once I finished with the "on ramp" at mile 3 I started to feel a twinge in my foot. I decided to take a step back and slow down with more walk breaks. 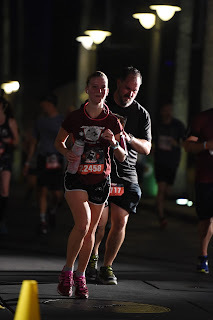 It was this half of the race that started to get hot and I started to get extremely sweaty, like sweat dripping off my nose sweaty. This isn't normal for me as I usually sweat very little, so I was glad for my decision to slow down. I was able to take advantage of the various hills along this section of the course. My strategy was to power walk up the hills, then jog down them and use the momentum from the down to help me get to a point ahead that I would focus on. I crossed the finish line feeling tired but not exhausted. I was able to comfortably collect my medal and food items, plus the pain in my foot had disappeared. I had assumed my time was above 1:20 but was happy to discover it was 1:16. This isn't a good time by my standards, and it' far from my goal of 1:05 but considering I've had to take two weeks off I am extremely happy with myself. No idea what my shorts are doing but I did it! Now for the pros and cons of this race. Pros: Fun and fast course. Plenty of water. Well organized. Nice medal and swag. Cons: No cooling towels after. The corrals were split into waves, I would have preferred more corrals. The river walk from Studios to the Boardwalk is always tight.